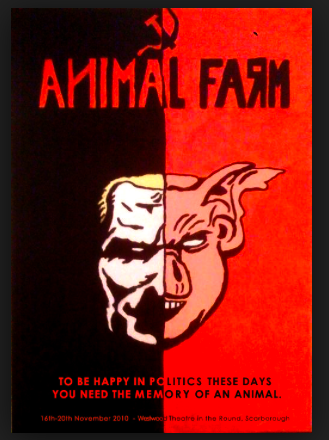 MNSBC host and self-described “Democratic political strategist” Krystal Ball was recently discussing Thomas Piketty’s latest book — the subject of which is income inequality — when she foolishly introduced into her dithyrabmic George Orwell’s famous book Animal Farm. “Of course I intended it primarily as a satire on the Russian revolution” (source). For those of you who haven’t read Animal Farm, every significant scene apes an actual event from Soviet history — including the Bolshevik Revolution, Trotsky fleeing the country, and Joseph Stalin’s Obama–like cult of personality. “At the end of the book the once-egalitarian farm has devolved into a dictatorship where the animals toil harder, longer, and for less food than they did under the yoke of human masters before the revolution. Back to the books, Krystal Ball.